STATEN ISLAND, N.Y. — A local legend is reviving the words of renowned Brooklyn rapper Biggie Smalls with a relevant new meaning. Staten Island's own Vernon Reid and his Grammy-winning funk rock band, Living Colour, will soon release a mixtape with a hard-rock version of the late rapper's 1994 song, "Who Shot Ya?," to reflect today's conversations around gun violence. 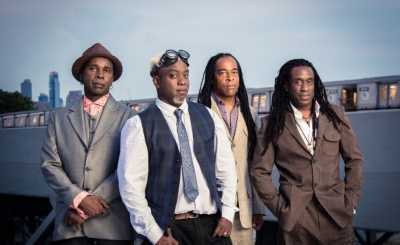 Reid founded Living Colour in 1984 and the band features singer Corey Glover, bassist Doug Wimbish and drummer Will Calhoun. The band reached popularity with their oft-covered song "Cult of Personality" but has largely existed as an underrated gem in the music world. While Biggie's original version is largely thought to be a response to East Coast v. West Coast hip-hop feuds, Living Colour's recording is part fan-love, part wanting to bring a new meaning to today's gun violence epidemic, Reid said in a statement to Pitchfork. "Tragically Biggie's question has taken on new and urgent significance over the last year," Reid stated. "The amount of people who die on a daily basis because of gun violence is unacceptable in a civilized society. The disproportionate use of deadly force in communities of color is equally unacceptable in a civilized society." Reid said the tragedies "inspired the idea to reach out to some of the most provocative voices in hip-hop to invite them to add their words to the track." "We all feel paralyzed as to how we can meaningfully affect change, but at the least we can keep our voices raised in solidarity and not let this plight fade into the background until it happens again."